Although TV and movies show us that someone on chemotherapy is thin, frail and bald, that isn’t how it always is. There are several different types of chemo therapy and each has different side effects. 2. A Little Perspective – One mother of a child with Histiocytosis says explaining the rare disease to your child, that could statistically kill him, is heartbreaking. “They (doctors) don’t explain how to answer, ‘Mommy, I don’t want to die. '” She says its hard to hear other parents complain their kids are driving them nuts or they can’t for them to go to school when she’s just thankful her child is still alive. 3. Caregiver Taking Care of Themselves – I hear parents of children with rare diseases talk about how exhausted they are, that they aren’t eating right and that they miss having alone time with their significant other. Yet, they feel too guilty about having someone else care for the child so they can get a break, take a nap or have a date. I rarely ate after Joey’s bone graft. I would literally forget. And when I would eat, it wasn’t healthy and I rarely sat down to eat. I quickly learned that I had to take care of myself so that I was able to take care of Joey. That meant letting other people take care of him even if it was only so I could take an hour nap or run to the store. 4. Dr. Anxiety – People with rare diseases visit the doctor A LOT! They have a lot of scans and blood tests and many go through chemo or other treatments. Many children start fearing the doctor. They worry about needles, treatment and being hospitalized. As parents we have to find ways to calm these fears even though we know all of these things are a possibility. 5. Insurance Headaches – The insurance company often tries to dictate what types of tests, treatments and meds our children can have. They actually question the doctor. This often causes tests and treatments to be delayed or for parents to have the additional worry of how they will pay for it if the insurance doesn’t come through. They also have to spend time fighting with the insurance company, time that could be spent caring for their child. Have you experienced any of these things? 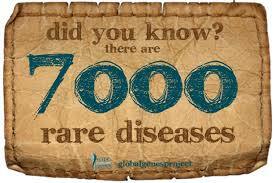 Anything else people should know about rare diseases? Anything that surprised you? Knowing that it might be used in a future blog post, what are things you have done for a family going through something like this? If you are a family dealing with a rare disease, what could others do to help?